I'm back from vacation, speckled with mosquito bites and sporting a few nasty (yet non-life threatening) wounds. Where was I? Swimming through dark rainforest caves with a waterproof flashlight strapped to my forehead. Getting up close and personal with barracudas and sharks. Skimming across crocodile-infested waters in boats old enough to have ferried my great-grandparents across the Volga. Pretty much your average holiday, I suppose. In the 1920s, sixteen-year-old Anna Mitchell-Hedges accompanied her father, a well-known English adventurer and writer, on an expedition to the country then known as British Honduras. (It's now named Belize.) Back in those days, pretty much anyone could grab a shovel and call himself an archaeologist, and F.A. Mitchell-Hedges (author of books such as Battles With Giant Fish; Danger, My Ally; and Land of Wonder and Fear) was no exception. He set about raiding temples that had long belonged to the jungle—probably destroying far more than he uncovered. Known today as the Skull of Doom, Anna's discovery has been a source of controversy for decades. Perfectly detailed and cut from extremely hard quartz crystal, the skull appears to have been crafted using technology unavailable to the ancient Maya. Yet even with modern tools, the skull would have required a remarkable amount of time and skill to produce. In other words, even if it isn’t ancient, the Skull of Doom is no ordinary fake. 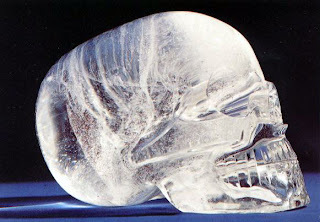 There are many who say that the beautifully made-skulls are of alien or Atlantean origin and boast supernatural powers. There are others who insist that the skulls can all be traced back to an enigmatic French art dealer named Eugène Boban. But whether the skulls are thousands of years old—or only slighly older than the Eiffel Tower—one thing's for certain. 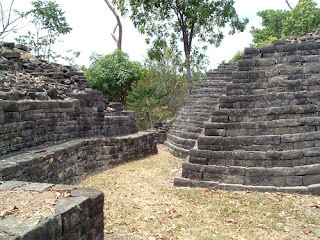 The Maya who still live in the jungle that surrounds Lubantuun want their skull back. For now, it's still decorating the living room of Anna Mitchell-Hedges, who died in April at the age of 100. I can't speak for all Maya, but that's what I was told by the people who care for the site and work in the vistors' center. They sounded quite ticked-off. As for the history books, they're unlikely to waste much paper on an artifact that might be a fake. 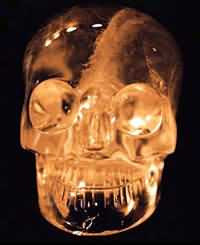 I think there was a Discovery or History channel program about the skulls not long ago. You might be able to dig it up online, if you're interested.